It is possible that in the first phase of your pregnancy you may experience a slight blood loss. This does not indicate that the pregnancy will miscarry. It can be bleeding caused by a burst blood vessel in the uterus wall due to the implantation of the fertilised embryo. If this happens, contact your GP or midwife. If you are not yet registered with a midwife you can still call to ask advice. 8 weeks pregnant – how is your baby growing? 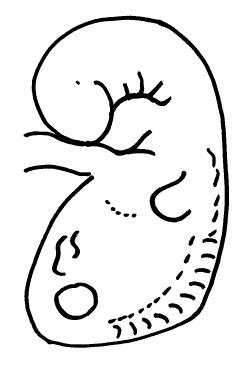 The little child can no longer be called an embryo but is now a foetus. In one week the baby has doubled in size. It is now approximately two centimetres long and weighs about one gram. It starts to resemble a person and all the important organs are formed. The heart is working and there is blood circulation. The skeleton is under construction. The shoulder, elbow, hip and knee joints become slowly visible. The fingers and toes are still joined together with skin. I feel amazing I have a ton of energy and I feel much more hungrier than 8 weeks ago no wonder i've been getting so many cravings I don,the know what baby i'm having just I feel that I will have a girl or a boy but I think it's a girl by the size of my belly and I keep having dreams about me playing with my unborn kids it looked like I gave birth to more than one baby in my dream could I be pregnant with twins.